As we edge ever closer to Christmas, brands are starting to release their themed gifts. This month Glossybox bring you the 'stocking fillers' box*. I hope you're sitting comfortably for this as it's a long one. Body butters aren't something I'm usually a fan of. I personally find them too thick for my skin and whilst they usually smell gorgeous, they take so long to sink in. The scent is very fruity but not too sweet. More like a natural mango scent rather than artificial. It's quite thick but seems to melt into the skin without too much work and doesn't stay sticky on the skin long afterwards. It's a really nice product to keep you hydrate during Winter. This is honestly my dream come true. I've blogged numerous times before in the last couple of years about how bad my hands dry out. Sorry for the TMI but I used to get dermatitis so bad (especially in the colder months) that all over my knuckles and the tops of my hands would dry out to the point where they would start cracking and bleeding. I tell you now, it wasn't nice and it was extremely painful. I started using Soap & Glory's Hand Food a year or two ago. And whilst it does keep it from being as bad as it was, the texture is quite thin and I've noticed in the past couple of weeks my hands are becoming really quite dry again so it isn't really getting rid of it. This is just wonderful. It's a thick cream but adsorbs into the skin really quickly. It's got a really fresh, quite strong floral smell and stays fragrant for a while after applying but I love that. Even after just one use I can see this becoming a firm favourite. It's left my hands wonderfully smooth and pain free. This sample size is actually available to buy at a small price of £4. Perfect to chuck in your handbag or if you want to try it out. They also do a few different scents, the pomegranate sounds divine, definitely on my wish list. Monu are a brand that have popped up a few times in recent Glossyboxes. This is a marine collagen enriched cream to soften and smooth the skin. It has neroli and lavender essential oils in it. There's something in this that I really really don't like the smell of. I'm not sure what it is but it's very off putting to me and it's really strongly scented so it's not something that you can just ignore. This is something I won't be using. This is such an odd concept and one I haven't seen before. Glossybox say 'its a unique rice-based powder that gently exfoliates skin, leaving it noticeably smoother and brighter'. I'm used to exfoliaters that are already liquid and usually have salt/sugar/sand/beads in them. This however is a powder which you shake into wet hands after cleansing and it creates a thin paste. I love really 'scrubby' exfoliators but with my combination skin they aren't always so kind to my dryer patches. This is extremely gentle, enough to use daily. It hardly feels like an exfoliator at all. It is an expensive product but after just once use I could feel the difference in my skin. I do think the full size of this would last for ages as you only need a tiny amount. Definitely something I'm thinking about purchasing. Notting Hill Gate is a bright, clean, blue based pink. Nails Inc. state it's a neon on their website. It's bright but it's no where near as retina searing as some of the neons I have in my collection. It's almost opaque in one coat but there's still visible nail line. In two coats it's completely opaque. As with most neons and super brights, it dries down to a satin finish. A slick of top coat will give it that high shine most like. It applies well and dries super quick. I really like the colour and the bottle size is just the cutest! 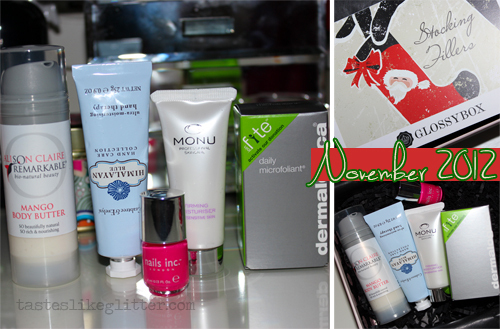 I usually try and not say too much about each product in my Glossybox reviews as it just makes it super long. This month I really loved everything apart from the Monu so I had lots to say. I usually prefer the predominantly makeup boxes so I was really surprised that I loved this as much as I do. Let's hope the Christmas box tops this.